Lairig Ghru Micro Adventure with Bob the Collie. The Lairig Ghru Micro Adventure with Bob. During the summer, I planned a wee adventure along the Lairig Ghru. I packed up my tent and Bob the dog and off we went. 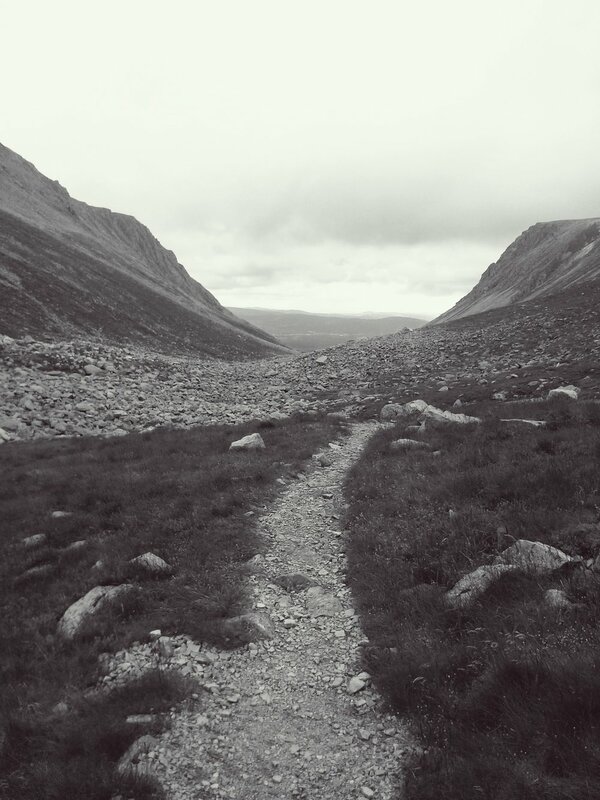 The Lairig Ghru is a classic hill-pass walk in Scotland climbing a gentle 835m and crossing through the Cairngorms. We walked from Deeside towards Aviemore and back again totalling 30 miles with a lovely wild camp overlooking Rothiemurchus Forest at the half way point. We are lucky enough to have free roam in Scotland when it comes to camping (leave no trace, of course). The day started off nicely with dry weather and even some blue skies. Bob eagerly pulled forward not being very impressed about being leashed - It's bird breeding season so them's the rules, buddy! We saw lots of lovely wildlife including a Ptarmigan with 5 little fluffy chicks. There were frogs everywhere too. We stopped for lunch at a nicely forested area overlooking the river where there were a few groups of walkers passing by enjoying being outside and cheerfully saying hello. I let Bob off the lead so he could cool himself off in the river and have a drink. He had two sausage rolls to himself and would have had another had there been any left. It is very difficult to get back from Aviemore once there and my plan was to just walk as far as I could along the pass, camp and then walk back again. I managed 15 miles on the first day and felt happily tired. I passed the pools and boulder field and popped our tent up overlooking Rothiemurchus Forest towards Aviemore which was really pretty. It was getting dark and the dreaded midgies had found us so Bob and I snuggled up inside the tent and had some more food. We got a few hours sleep before I woke up with the sunrise and at 4am we were on the move again. Our tent, a Tarptent was packed away in under 2 minutes! I may have taken more care had the midgies not made a dramatic reappearance but I was super grateful it was so quick. With the previous days miles, and the super-early start, I was now really tired and beginning to regret every decision I'd made in my life that had led me to this moment. After I had woken up a little and with some breakfast in me I felt great again and Bob and I were well on our way. I was so glad to get back to the car though - 30 miles was a bit much for me even with a sleep in the middle! Bob was tired too and immediately curled up and napped in the foot-well. From there it was a beeline for the nearest and most excellent coffee shop 'Bean for Coffee' in Ballater. I limped my way into the shop and ordered a large latte. About 15 minutes later I limped back to the counter and ordered another. Despite overestimating my fitness on the second day I really enjoyed myself and Bob was fussed over by lots of people. It's a popular walk and if you ever get the chance to do it - do it! And if you're feeling extra energetic the Lairig Ghru Race is held there every year too.